In one weekend, volunteers picked up 15,000 pounds of trash here. Kamilo Beach lies at the easternmost tip of the Hawaiian Islands. Grassy green hills slope down toward the sand, and dark volcanic rock has birthed tidepools throughout the beach. It could be the perfect spot for an afternoon of relaxation amid the sound of crashing waves. But few people spend time lying on this beach. Those who visit Kamilo Beach are more likely to be scientists, activists, and volunteers. They spend their time cleaning up some of the world’s 8 million tons of plastic that find their way into oceans and then onto beaches like Kamilo each year. Kamilo Beach, which translates from Hawaiian to “twisting or swirling currents” is more often known as “Plastic Beach.” It’s one of the dirtiest places in the world. Last month, Hawaii Wildlife Fund, an ocean conservation organization, picked up 15,000 pounds of trash over the course of just one weekend at Kamilo Beach. Centuries ago, native Hawaiians would gather giant evergreen logs that floated down from the US Pacific Northwest and landed on the shores of Kamilo Beach, using the logs to build dugout canoes. Today, instead of collecting trees or other natural materials, Kamilo Beach is a hook for the world’s plastic debris. 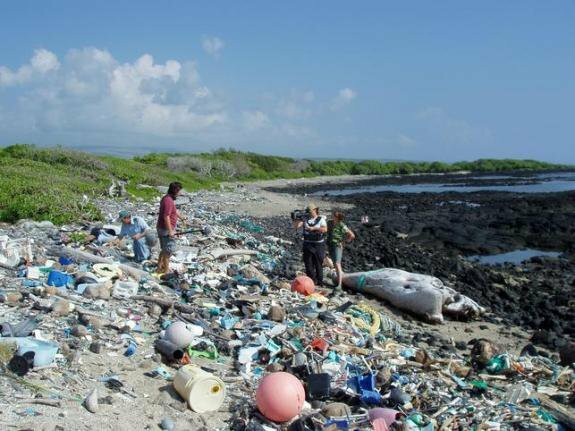 Trash from Japan, Russia, the US, and other countries finds its way to the Big Island of Hawaii’s Ka’u coastline, and the most southern tip of US where Kamilo Beach is located. Over 90% of this trash is plastic. "This plastic sand is coming from all around the Pacific rim, swirling into a vortex which eventually brings it to these shores. This is the place where Hawaiians came to find bodies of people who were lost at sea. Nowadays, this beach is where we come to find what our throw-away society has done to the environment,” environmentalist Charles Moore told Hawaii News Now. Plastic at Kamilo Beach has been an issue for decades. HWF regularly cleans up Kamilo Beach, but because of its location the beach is consistently bombarded with plastic waste. “The Hawaiian archipelago acts like a sieve, collecting debris that was floating around the Pacific Ocean and accumulating it along our shores,” Megan Lamson, director of HWF on Hawaii’s Big Island and survey diver for the Hawaii’s Division of Aquatic Resources, told The Huffington Post. “My shoes were filling up with little bits of plastic. That’s never happened to me before at any beach,” Suzanne Frazer, a volunteer with HWF, said back in 2007. Ten years later, HWF continues the endless battle to stave off the massive vats of plastic, large and small, that migrate to the Hawaii’s eastern coastline. Volunteers from recent beach cleanups have similar takeaways as Frazer. Each year, volunteers clean up between 15 and 20 tons of trash from Kamilo Beach and its surrounding nine-mile-long coastline. 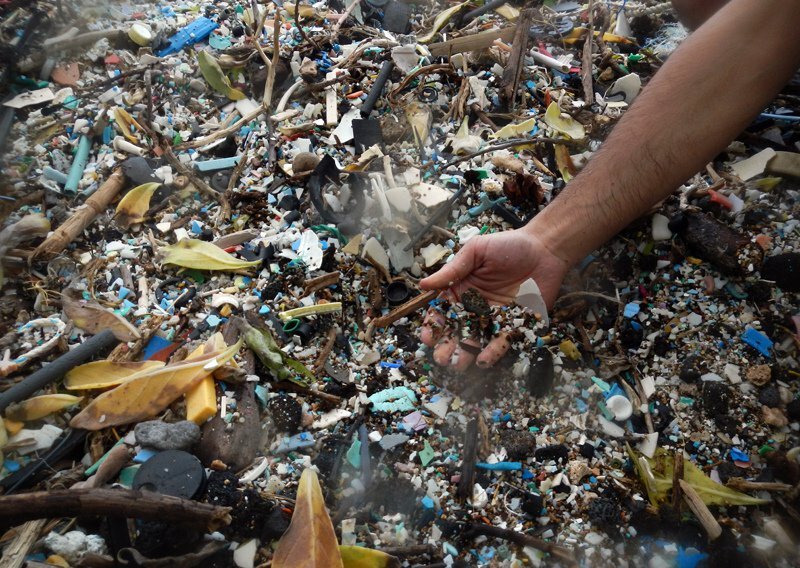 Once plastic enters the ocean, UV rays break it down into smaller and smaller microplastics. This creates a swampy soup of plastic debris that can collect on massive scales, such as the Great Pacific Garbage Patch. Plastic can take hundreds to thousands of years to break down completely. Fishing line, for example, lasts for 600 years in oceans. As long as people continue to use plastic at current rates, beaches will remain covered in garbage. There is simply not enough human power to keep up with beaches like Komila that act as convergent points for ocean currents carrying plastic. While HWF’s efforts should be applauded, beach cleanups shouldn’t be the only answer for places like Kamilo Beach. 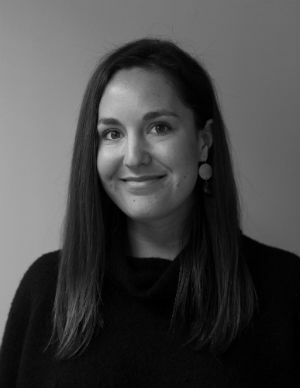 Ocean activists like Megan Lamson believe the solutions must come from reducing plastic and finding alternative methods to an unsustainable material. Innovative solutions are all around. And bizarre-sounding inventions like edible water bottles, and mushroom packaging are just some ideas for the future that can transform “Plastic Beach” back to its natural habitat.